For the fifth year in a row, Wilfrid Laurier University’s intramural program has been named one of the best. The Canadian Intramural Recreational Association rewarded Laurier with the Outstanding Program Award for the fifth-straight year in mid May. The award comes just over a year after the Athletics Department decided last April to discontinue the volleyball program at the school.Last year, director of athletics Peter Baxter explained that the cut of the volleyball team was to explore the expansion and usage of intramural and club-oriented sports. Fast-forwarding a year, the expansion of the intramural program with the ever-growing population of Laurier, has become nationally known. As of June, the Athletics Department confirmed that approximately 170 new students were able to play each sport as a result of the opened time and accessibility to venues and materials, which totals to almost 7,000 students playing an intramural sport a year. 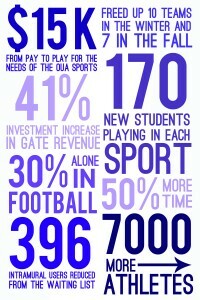 Jennifer O’Neill, the coordinator of programs and recreation at Laurier, commented on the growing popularity and progress of the intramural program. With the approach of the 2011-12 school year, Laurier Athletics was able to free up space and time for ten new teams in the fall, as well as seven teams in the winter. 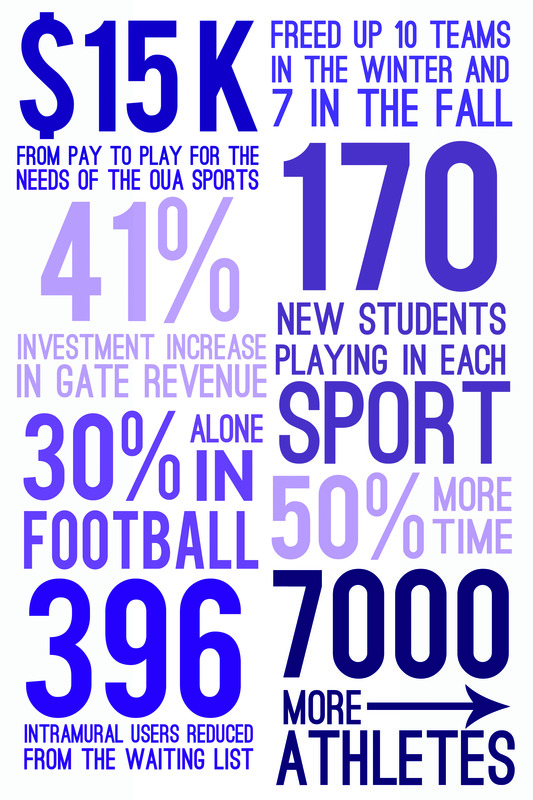 There was also a 50 per cent increase in drop-in time for students to use the Athletic Centre and University Stadium courts at leisure. Baxter also commented on the staffing issues of the full-time members of Laurier Athletics. He said that the past year, there has been a decrease in overtime and management stresses of the facilities. As a result of the marketing support, there was an increase in gate revenue for the varsity teams by as much as 41 per cent. Revenue from football alone increased by 30 per cent. “I think what it’s done is open up money. A lot of it has to do with money,” Baxter said. Although the money from the axing of volleyball has benefited the overall financial stability of Laurier Athletics, O’Neill says that the money has not been a factor in the intramural department. In the previous academic year, the intramurals saw an increase in every sport and activity except inner tube water polo. In terms of the volleyball students that were affected by the cut of their program, O’Neill still sees students benefitting from the recreation at Laurier. “I do know that I have some of the varsity volleyball players now working in the intramural program. Some of them have taken up senior positions in intramurals,” she said.